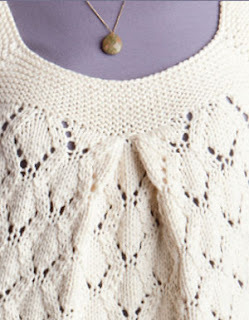 The second design in my book, Finish-Free Knits is the Joy Lace Tunic. As the name implies, Joy is a pleasure to knit. Equally fun to wear, it can be paired with jeans, a skirt or cool cotton shorts for trans-seasonal wear. Beginning with a picot cast on, the body is worked in a lacy tube to the underarms, then box pleats are added to the bust. Extra stitches are cast on for the straps and the yoke is shaped in garter stitch. There is a lot of joy in simplicity! I swatched this with the intention of designing something for my new niece, who had just recently been born at the time. The idea was to make it into a dress for an infant and/or toddler. I even tossed around the idea of making it into a mother-daughter set. Unfortunately, I didn't have enough of that pink yarn on hand to knit it up, so the design eventually fell to the side, and I knitted the Spring Baby Cardi for my niece instead. But I couldn't let go of the design entirely—I just loved it too much! It's exciting for me to include it in this book! This design is pretty basic, with a few fun elements added to make knitting it more interesting. The picot cast on is a fun way to add texture to the cast on edge. The lace pattern adds some over-all interest. It's a 12-round lace pattern, but it's really easy to memorize. All the even numbered rounds are knit, leaving only 6 rounds that have lace. Of these 6 rounds the first 3 are basically the same as the second set of 3, only shifted over 6 sts. 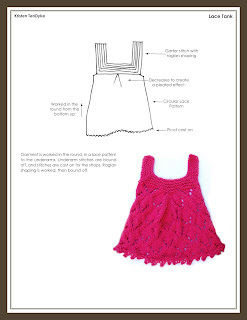 The pattern includes a chart for the lace pattern so you can easily see what is being done. If you've never worked from a chart before, there is a tip box on page 26 explaining how to do it! The A-line shape of this top is created by decreasing stitches at the upper part of the front by working a set of pleats. All of the body decreasing is done here. 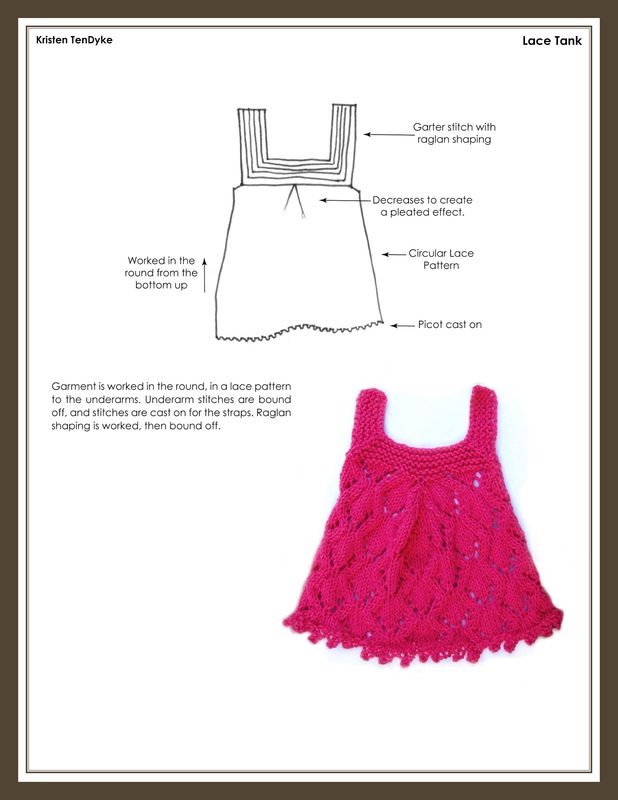 The pattern includes written instructions and a diagram showing how it's done! To finish off this really fun-to-knit top, there are just a handful of simple decreases worked to shape the garter stitch at the top, which makes this pattern is a great intro to raglan shaping. I knit this sweater in a matter of days. The worsted weight yarn worked up quickly and the lace pattern kept me interested. This was one of the last sweaters I knit for the book, and it had to be shipped away shortly after knitting. I really can't wait to get this sweater back so I can wear it! It's really one of my favorites!